Nearly two years ago I wrote two blog posts giving a high-level view of the Online Program Management (OPM) market landscape. This is a growing but messy market, and the market changes since mid 2016 call for an updated view. OPM providers are for-profit organizations that help non-profit schools develop online programs, most often for Master’s level programs. These companies provide various services for which traditional institutions historically have not had the experience or organizational capability to fully support, at least for fully-online programs and often for non-traditional student populations. Some examples of the services include marketing & recruitment, enrollment management, curriculum development, online course design, student retention support, technology infrastructure, and student & faculty call center support. The OPM market has historically been known for a full-service, revenue-sharing model, based on the premise that most traditional institutions are not only operationally unprepared to offer online programs at scale but also are not set up to invest in online programs up front. 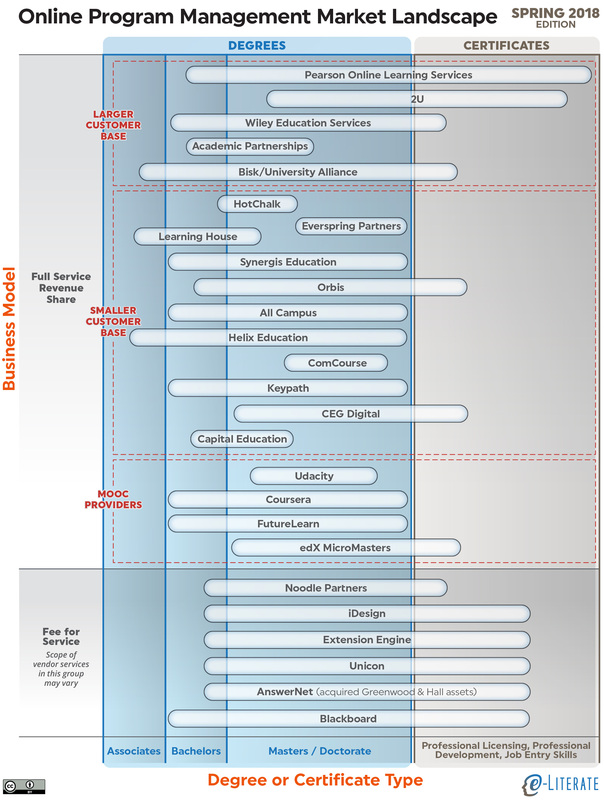 There are extensive costs, particularly in marketing and recruitment as well as curriculum and course design, that cause most scalable online programs (that is, those designed with the intent and infrastructure to allow more than just a few dozen students) to require investment over the first several years, before tuition revenue catches up. Rather than requiring the institution to spend sizable up-front money without a guarantee of repayment, revenue-sharing OPM vendors provide this financing themselves - which is in itself an expensive proposition. It often takes three to five years for an OPM company to become profitable for any online program, which is why they often require 10-year or even longer contracts. As the online education market has matured, however, there has been a growing pushback against revenue-sharing as the only model available. Thus there is an emerging unbundled fee-for-service OPM model, in which the companies offer the same services, or some subset, for the market price of those services. The institution pays for the services used, mostly independent of the amount of tuition revenue coming into the online program. This category leads to the program, or institution, to take the up-front financial risk but not have to sign contracts sending ~40 - 60% of the tuition revenue to the vendor. Fewer strings attached but more responsibilities and risks for the school. With the recent success of Southern New Hampshire University and longer-term models from Penn State World Campus (as well as others), there are also questions about whether non-profit schools can create scalable programs without an OPM partner at all. This category, for obvious reasons, is not presented in our market landscape but is a real option. In our view, there is not an either-or proposition in the market. We see strong arguments for both bundled revenue-sharing models and for unbundled fee-for-service models, and I personally do not believe that the market is moving away from revenue sharing as much as there is pressure for additional models. There are a growing number of choices available to schools, but there is also a crowded marketplace that is becoming more difficult to understand. With that setup in mind, on to the market landscape graphic. As before, please note that this view is intended to give a visual overview of the market landscape and is not comprehensive in terms of vendors represented. This is especially important to understand for the Fee for Service category, where there is no clear definition yet of what is an unbundled OPM provider and what is a product or service provider who happens to serve online programs. Treat this category as illustrative and not exhaustive. We have combined different categories of Certificates into one column on the right side of the graphic, since it was difficult to to differentiate between OPM target markets. We have added a sub-category of MOOC Providers under Full Service Revenue Share category to capture the recent changes in that market. We have combined the Fee for Service and General Contractor into one category labeled Fee for Service, again due to difficulty differentiating service offerings. We should also note that there will likely be another sub-category of Full Service Revenue Share to capture the ongoing pivots by former for-profit institutions. Graham Holdings sold Kaplan University to Purdue University and remains a single-client OPM provider for that new brand Purdue University Global. Grand Canyon University is converting to a non-profit institution with the remaining for-profit company turning into a (single-client?) OPM provider. Bridgepoint Education plans to turn Ashford University and University of the Rockies into a combined non-profit institution, leaving the remaining for-profit company as an OPM. We are not ready to add this sub-category, and it is not clear yet if these providers plan to go beyond servicing the non-profit conversions. Pearson no longer refers to the Embanet brand that they acquired and now goes by Pearson1 Online Learning Services. 2U, after the May 2017 acquisition of GetSmarter, now serves certificate programs and not just masters degree programs. Wiley no longer refers to the Deltak brand that they acquired and now goes by Wiley Education Services. DeVry Integrated Education Solutions no longer appears to be active in the market, based on outdated web site (key executive listed has been gone for seven months) and no marketing or competitive presence. We have removed their listing. Cambridge Education Group's CEG Digital unit has emerged as an OPM provider serving UK-based institutions. We (re)added Udacity based on the success of the Georgia Tech Masters in Online Computer Science program, which has helped spawn the new sub-category of MOOC Providers in the market, even though Udacity appears to have no interest in pursuing other higher education degree offerings. We added Coursera as an OPM Provider, as this market now appears to be their core market moving forward. We added FutureLearn based on their continuing expansion as a MOOC-based OPM provider. We added edX with their MicroMasters initiative. We added ExtensionEngine as a Fee for Service provider based on their work with Notre Dame and related program creation. We changed Greenwood Hall to AnswerNet. After a spectacular implosion from Greenwood Hall a few months ago, AnswerNet acquired the remaining assets. It is not yet fully clear if AnswerNet will not provide more than Call Center services, so we'll keep an eye on this one. Excelsior College's Educators Serving Educators (ESE) initiative, launched in 2012 to provide a non-profit OPM offering, is no longer active. We'll keep updating our landscape diagram over time and look for other methods to help make sense of this market. Navitas is interesting company that has some similar goals as OPMS (sustainable growth, partnerships, etc). But I do not see them helping create or manage an online program based on university academics. How does Collegis Education fit into this picture? Too small? KS, that was a judgement call, but I might want to add them in future versions. I’ll do more research. In other words, there was not a conscious call that they *shouldn’t* be in graphic. Do you know which OPMs are offering solutions for the Spanish speaking market? Hi Gustavo, thanks for your question. My name is O’Neal Spicer, I work with Phil Hill at e-Literate and follow the OPM market, among other things. As you probably know, a number of the major OPMs, and some of the smaller ones, actively market and recruit students from Spanish and Portuguese speaking markets to enroll in programs at their partner schools, mostly in the U.S. (and mostly in English). The number that partner directly with Latin American or Spanish universities is much smaller, but we are seeing increased interest from OPMs in pursuing international partnerships. The global expansion of the OPM market is something we’re watching closely here at e-Literate. I’d love to learn more about what your organization is doing in Latin America. Feel free to contact me directly at [email protected].